The US said it carried out an air strike in Syria against an Al-Qaeda meeting but denied hitting a mosque where a monitor said on Friday 46 people were killed. SYRIA: The US said it carried out an air strike in Syria against an Al-Qaeda meeting but denied hitting a mosque where a monitor said on Friday 46 people were killed. 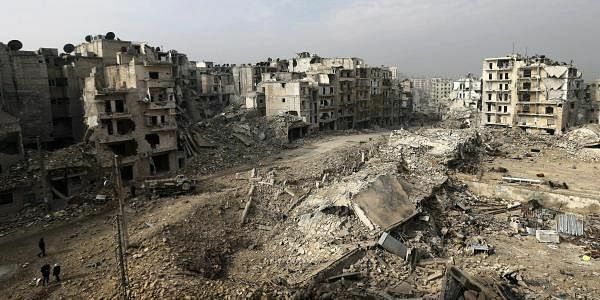 The Syrian Observatory for Human Rights said most of the dead in the Thursday evening raid on the village of Al-Jineh in the northern province of Aleppo were civilians. In Washington, the Pentagon insisted a mosque was not hit but rather a nearby building with "dozens" of Al-Qaeda members inside, "several" of whom were killed. "The mosque is still standing and relatively unscathed," Pentagon spokesman Navy Captain Jeff Davis said. "The building we targeted was adjacent" and the strike "clearly hit the intended target". He showed a black-and-white image of what appeared to be an old mosque with a flattened building a short distance away. Davis did not say what that destroyed building's purpose had been or whether it could have been somehow connected to the old mosque in Al-Jineh. The US has been bombing jihadists in war-torn Syria as part of an international coalition since 2014, with hundreds of civilians unintentionally killed in the country and in neighbouring Iraq. The US Central Command said on Friday that it would "look into any allegations of civilian casualties in relation to this strike", which was carried out unilaterally by the United States. At the scene, an AFP correspondent saw rescue workers in white helmets working under spotlights with picks and shovels late on Thursday to dig people out of the rubble. Much of the building, identified by a black placard outside as a mosque, had been flattened. The empty prayer hall was covered in debris, and rescue workers stepped through it carefully, discussing how to break down a wall to search for more survivors. Fearing additional air strikes, weekly Friday Muslim prayers were cancelled in towns and villages across northern Syria, AFP's correspondent said. Rescuers had earlier left the wreckage site but were forced to double back when they heard moaning come from the rubble. "More than 100 people were wounded," Observatory head Rami Abdel Rahman said on Thursday, adding that many were still trapped under the collapsed mosque in Al-Jineh, just over 30 kilometres (20 miles) west of Aleppo. The village is held by Islamist groups, but the Observatory said no jihadist factions are present. Abu Muhammed, a village resident, told AFP that he "heard powerful explosions when the mosque was hit. It was right after prayers at a time when there are usually religious lessons for men in it. "I saw 15 bodies and lots of body parts in the debris when I arrived. We couldn't even recognise some of the bodies," he added. The strike was condemned by Islamist group Ahrar al-Sham, which said targeting mosques was a war crime under international law. More than 320,000 people have been killed in Syria since the conflict began with anti-government protests six years ago. A ceasefire between government forces and non-jihadist rebel groups was brokered by rebel backer Turkey and regime ally Russia in December, but violence has continued. The skies over Aleppo province are busy, with Syrian regime and Russian warplanes as well as US-led coalition aircraft carrying out strikes. The US-led coalition said earlier this month that its raids in Iraq and Syria had unintentionally killed at least 220 civilians since 2014. Israel has also carried out air strikes elsewhere in Syria. Before dawn on Friday, its warplanes hit several targets near the famed desert city of Palmyra, prompting retaliatory missile launches, in the most serious incident between the two countries since the Syrian civil war started in 2011. The Syrian army said it had downed one Israeli plane and hit another, but Israel's military insisted the safety of its aircraft had not been compromised. Israel said it intercepted one missile. Jordanian military sources said missile shrapnel struck in the north of the kingdom without causing any casualties.